Have you ever wondered how your date of birth affects your love life, the unique qualities that define you, and the passions that drive you? Or why everyone seems to be talking about Mars and Venus, and their influence on intimate relationships? In Lovestrology, the author draws on the predictive powers of astrology and the ancient art of numerology to create revealing romantic portraits that provide everything you need to know to enjoy great relationships. The book is divided into two sections. Part One: The 366 Birthdays of the Year gives a comprehensive individual romantic profile for each birth date. Part Two: Men and Women are from Mars and Venus delineates the drives and passions associated with each Mars sign, shows the ways in which you share love and affection via each Venus sign, and provides readings for each of the 144 possible Mars/Venus combinations. The sign connections between the planets of love and passion on your birthdays indicate the compatibility potential between you and your lover. 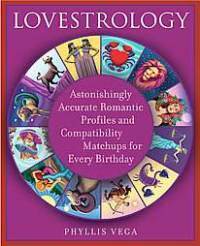 Lovestrology manages to be unfailingly upbeat and positive without sugarcoating the challenges and difficulties symbolized by each of the 366 birthdays and 12 zodiacal signs. This provocative book sheds new light on your prospects for finding and maintaining a successful love relationship.